Alison Lapper MBE (born 7 April 1965) is an English artist. She is also the subject of the sculpture Alison Lapper Pregnant, which was on display in Trafalgar Square from September 2005 until late 2007. She and her son Parys feature in the ongoing BBC docuseries Child of Our Time. Alison Lapper was born on 7 April 1965 in Burton upon Trent, Staffordshire. She was born without arms and with shortened legs, a condition called phocomelia. She was institutionalized in her infancy, and is still distant from her relatives. When she was fitted with artificial limbs, she experienced them only as an attempt to make her look less disconcerting instead of actually helping her. So she abandoned them and learned to live without external aids. Lapper then moved to Brighton and studied in The Faculty of Arts and Architecture at the University of Brighton, graduating with a first class honours degree in Fine Art in 1994. Lapper uses photography, digital imaging, and painting to, as she says, question physical normality and beauty, using herself as a subject. She is a member of the Association of Mouth and Foot Painting Artists of the World (AMFPA), having joined as a student member and receiving a full membership after her college graduation. One particular influence is the sculpture Venus de Milo, due to the physical similarities between the idealized classical female statue and Lapper's own body. She has taken part in various British exhibitions, including in the Royal Festival Hall. In May 2003, Lapper was awarded an MBE for her services for art. After she had given birth to her son Parys in 2000, she created an installation of photographs of herself with him. Lapper and her son have featured on the ongoing BBC television documentary Child of Our Time. In 2006, she published her book My Life in My Hands. A giant replica of the sculpture in the 2012 Summer Paralympics opening ceremony. She posed for Marc Quinn for the sculpture Alison Lapper Pregnant. Initially she refused to pose for Quinn. Lapper's hesitation was regarding the way in which Quinn depicted disability. She wanted to be sure the depiction was not of pity. Quinn expressed how statues where their limbs had fallen off were highly regarded and cherished. His intentions were to create art involving bodies born this way. When Quinn phoned a few months after the initial call, Lapper informed him she was now seven months pregnant. His reply was, "That's even better!" In November 1999, Lapper went to Quinn's studio to have the cast made. The sculpture is made of Carrara marble. It occupied the fourth plinth in London's Trafalgar Square between September 2005 and late 2007. 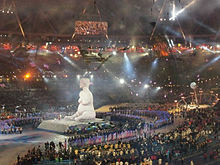 A large replica featured in the 2012 Summer Paralympics opening ceremony. In May 2003, Lapper was awarded MBE  for services to art. In July 2014, Lapper was awarded an Honorary Doctorate from the University of Brighton. ^ a b c d e f g Lapper, Alison (3 September 2005). "Beauty unseen, unsung". The Guardian. London. Retrieved 14 February 2012. Extract from autobiography, Lapper (2005). ^ Saner, Emine. "Alison Lapper: 'Disabled people are looked at as a drain on society, and I'm certainly not that'". The Guardian. Retrieved 2 February 2017. ^ Alison, Lapper. My life in my hands. Simon & Schuster. ISBN 9780743275583. ^ "Marc Quinn: Alison Lapper Pregnant". Fourth Plinth. Greater London Authority. Archived from the original on 26 April 2012. Retrieved 8 November 2011. ^ Hart, Christopher (25 September 2005). "Review: My Life in My Hands by Alison Lapper with Guy Feldman". Times Online. London. Retrieved 5 May 2008. ^ Lyall, Sarah (10 October 2005). "In Trafalgar Square, Much Ado About Statuary". The New York Times. Retrieved 5 May 2008. ^ Higgins, Charlotte (16 September 2005). "Sculpture's unveiling is pregnant with meaning". The Guardian. London. Retrieved 13 February 2012. ^ "BBC Newsnight Review, 15 September 2005". ^ Press Association (28 July 2014). "Artist Alison Lapper given honorary doctorate | Art and design". The Guardian. Retrieved 29 July 2014. Lapper, Alison (2005). My Life in My Hands. London: Simon & Schuster. ISBN 978-0-7432-7558-3. Wikimedia Commons has media related to Alison Lapper.